Kinder-Helpful Hints - Miss Allaire's 1st Grade! Here are some things we do in class that might be easy for you to do with your child at home. a story to go along with it! 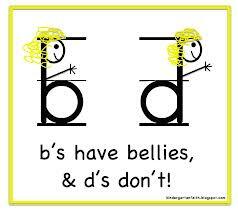 Lower case b and d confusion is very common. Don't worry parents, they will eventually get it! Until then, here are some ways you can help your child at home. 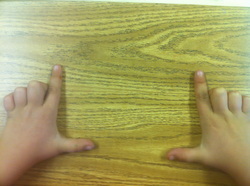 Students should be familiar with their Left and Right by the time they finish Kindergarten. We sing the LEFT RIGHT boogie in class, use our Left and Right when telling directions, and play a fun game called, "Left. Right, Center" -which I will send home directions for over break. 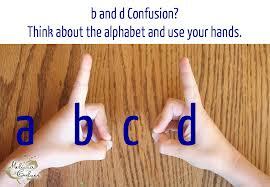 Use left and right at home in everyday language with your child! Write a number on a scrap piece of paper. Have child use hole punch to punch that many holes. from last nights dinner, into an activity! Cut circles for the bottom of the tin-either write color names or numbers. 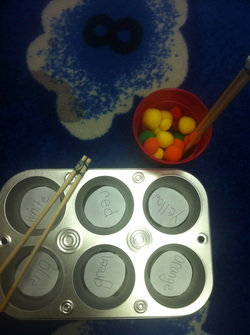 Child will use chopsticks to place the correct color pom balls into the tin. Or you can use cotton balls and place numbers in the bottom. Child must match the number in the tin to the cotton balls. -I tied a rubber band around the top, with a piece of paper stuck between the stick to give the child more of a tong feel. *Tweezers or clothes pins will also work! Copy and paste these websites into your browser and have fun!